• service book for repairs, costs, notes, etc. * Everything about each fuel up - odometer, date, fuel type, quantity and price. Add notes and see how your statistics for trips, fuel efficiency and money change. * Multifuels, hybrids and vehicles with alternative fuels supported. * Missed or lost fuel ups supported. Fuel ups can be added at any time and order. Calculations automatically handle marked gaps in fuel history. * Automated inteligent trip and fuel efficiency statistics. Both "full" and "partial" fills are supproted and calculated. 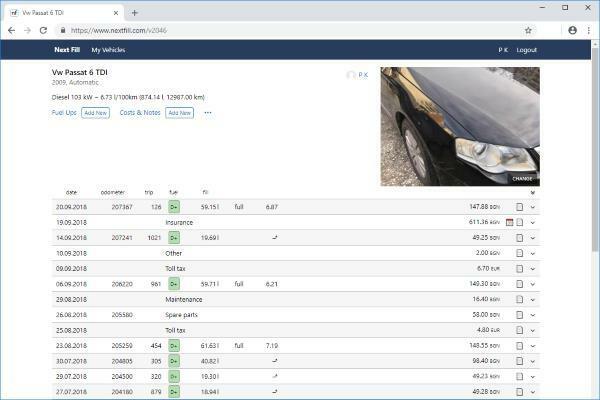 * Statistics area - contains up-to-date info and multiple numbers about the fuel records - total fuel spent, general fuel efficiency, total money for fuel and much more. * Service history for different activities - oil, filter, fluid and other changes. Optional fields for service intervals for time and/or distance. * Multiple types of expenses supported - repairs, tuning, toll taxes, fines, and many more. * Flexible reminders - important for service interval, insuarances, periodic activities and everything that is due by time and/or distance. 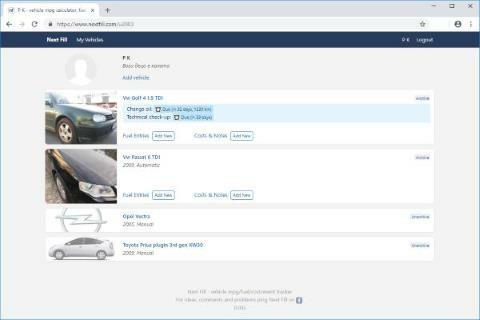 * Statistics area - automatically calculates expenses, groups by type, tells how much it costs to own and operate a vehicle. * Explore brands and cars - see how different brands, models and types perform. What are their fuel efficencies, running costs and more. * Use the badges and banners - show in forums your car live badge (it updates with each new fuel and expense record). * Manage your data privacy - configure which parts of your data are publicly visible. You can always hide some or all of your records and stats from the outside world.